“ . . . For such a time as this!” Apostle Steve Green’s apostolic works include training and mentoring ministers of the Gospel of the Lord Jesus Christ in the More Than Conquerors Ministry Training Center. Apostle Green has over 35 years of ministry experience including over 31 years as Senior Pastor. During his ministry career he has birthed and mentored over 35 pastors and licensed or ordained nearly 300 ministers and pastors. Apostle Green serves as a spiritual covering for 30 churches and 300 leaders, ministers, and pastors via his Shepherds House Ministry and Incense Ministerial Alliance. He is the founder of the R.E.S.P.E.C.T. (Respect Every Single Person Ever Created Today) Organization (a community based youth empowerment corporation) and the Annual Back-to-School Rally, the nation’s largest such event with documented attendance of up to 20,000 youths. The rally has received endorsements from the U.S. Department of Education, State of Alabama, Jefferson County, and City of Birmingham. Co-sponsors have included TBN, BET network, ABC & NBC Television stations and local radio. Since 1985, Steve Green has been and continues to be the senior pastor of the More Than Conquerors Faith Church, a growing congregation of over 3000 members. Pastor Green serves as chief executive officer of a multi-million dollar campus located in the inner city area of Birmingham, Alabama which is home to the main sanctuary and a state of the art Family Life Center. 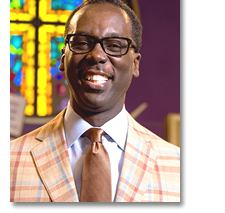 Pastor Green is seen locally and statewide on a weekly “Conquering Your World” television broadcast. Pastor Green has appeared as a guest on Trinity Broadcasting Network’s (TBN) International Praise the Lord Program and is a regular host of the local affiliate TBN broadcast. Pastor Green is a sought after conference and seminar speaker ministering at major conferences locally and across the country. Pastor Green, along with More Than Conquerors Faith Church, has received several awards for leadership and community involvement and service; most recently, 2016 SCLC “Keeper of the Dream” and 2016 National Action Network Community Excellence Awards. He has also received awards from the following civic and governmental organizations: The NAACP, Board of Education, State and County governments. Pastor Green has received the “Distinguished Citizen” Award from the City of Birmingham and the prestigious “Key to the City Award” from the cities of Birmingham, Dothan, and Jasper, Alabama. Pastor Green has also received the high honor of a street renamed “Steve Green Dr SW”. More Than Conquerors Faith Church, under the leadership of Pastor Green, was awarded the “2013 Best in Minority Business-Faith Based Award by Birmingham Magazine. Pastor Green has served on the Board of Directors of the Birmingham Chapter of Habitat for Humanity, the Mid-Alabama Region of the American Red Cross, and Clear Channel Media Group. He is a current member of the Jefferson County Commission’s Mural Committee. Pastor Green blazes new trails in the kingdom of God. He was called to the ministry in 1980 based on I Corinthians 2:9 “eye hath not seen, nor ear heard, neither have entered into the heart of man the things which God hath prepared for them that love him.” Pastor Green’s prophetic voice exposes the fallacies of religion and releases the people of God into their destiny. Pastor Green is a worshipper, a man after God’s own heart! Steve Green is a graduate of Jackson-Olin High School and later attended the University of Alabama-Birmingham. He is a devoted husband and father. Along with his wife, Deidra, he has seven beautiful children: Stephen, Rhema, Aubrey, Megan, Stephon, Stephanie, and Isaac.